UKIP's Scottish MEP David Coburn: "The prospect of a second independence referendum between the Autumn of 2018 and the spring of 2019 is utterly preposterous. "The UK will still be in negotiations with the EU at this time â€“ the SNP seem to wish to cause maximum disruption, uncertainty and overall mayhem. "In 2014 the Scottish people decided decisively to remain British, in 2016 less people voted to remain in the EU than voted to be British in 2014. "The SNP want to be â€œin controlâ€� not at the â€œmercyâ€�, have they been asleep whilst Greece has simply been bullied by the EU and when The Republic of Ireland twice voted the wrong way in a referendum and were forced to vote again courtesy of the EU. "Scotland as an EU member would be simply insignificant in comparison to Germany and France and we would simply follow or be told how to follow. "What the SNP are proposing for Scotland is a future of 'austerity Max". The very idea that it would be advantageous for us to leave the UK for a berth as a small but proud nation in the EU is foolish. We would be condemned to an austere damaging regime that would skip us of autonomy and and leave us open to penal austerity measures such as those imposed on other small nations. "The SNP do not like having a Tory Government in Westminster, neither do I. But at least we have Scottish cabinet ministers and Scotland is fully represented within the chambers of Westminster. "The EU has well over 700 MEPs at the moment, and Scotland gets only 6 â€“ Scotland would have no huge influence whatâ€™s so ever. The SNP do not want real independence, they want 'plastic indy'. "They would rather be ruled from Frankfurt and Berlin rather than Edinburgh and London. Scotlandâ€™s Education system is failing, roads are crumbling and the NHS has seen better days â€“ therefore they must revert to these diversionary tactics." I was captured by the emotion of playfulness and I thought about a dog and the personality qualities I want to see in him â€“ naughty, playful, friendly, joyful, clever and very silly. Here he is, I called him Scotty! 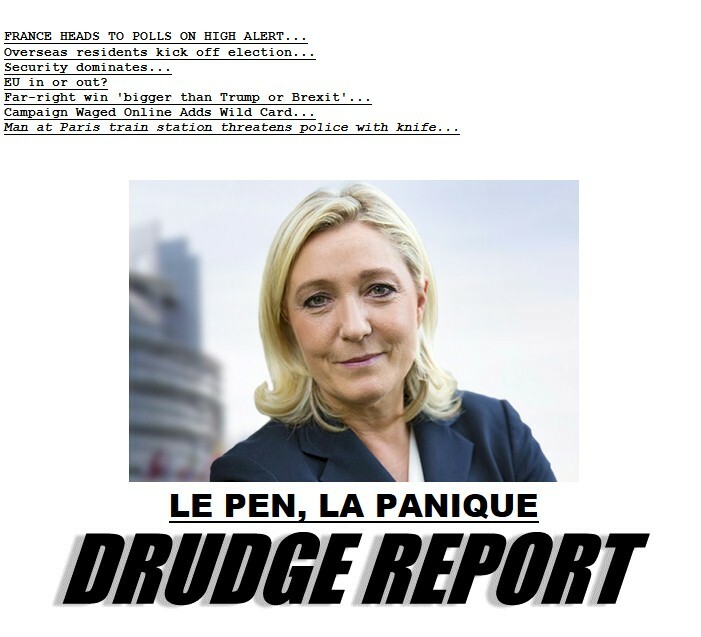 Le Pen said: â€œI want more Franceâ€�. Front National leader Marine Le Pen blasted globalism and Islamism in a major campaign rally Sunday, remarking that the European Union was destined to collapse because ordinary people were no longer interested in keeping it alive. 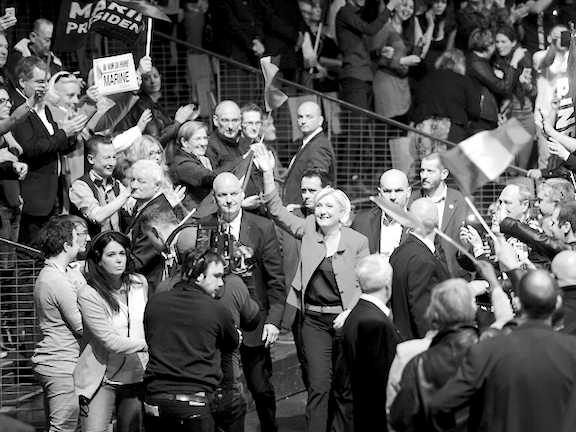 Speaking to a crowd of thousands in Lille Le Pen said of the European project, which celebrated its 60th birthday this week and has lurched from crisis to crisis in recent years: â€œThe European Union will die because the people do not want it anymoreâ€¦ We will change for another Europe, the European idea harmed by the federalists will re-energize itself, re-invigorate itself in the Europe of the people and of â€¦ the nationsâ€�. On her nationâ€™s continued membership of the EU and the Euro currency union, Le Pen remarked â€œthe French will have the last wordâ€�. 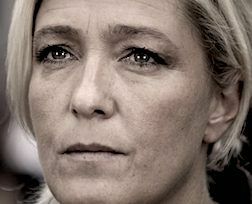 Calling for France to â€œreconnect with the greatness of our countryâ€�, Le Pen said the Republic would â€œregain her independence, the rule of law, the sweetness of freedomâ€�. Theresa May will call on the British people to unite as she triggers article 50, beginning a two-year process that will see the UK leave the European Union and sever a political relationship that has lasted 44 years. A letter signed by the prime minister will be hand-delivered to the president of the European council at about 12.30pm â€“ as she rises in Westminster to deliver a statement to MPs signalling the end of the UKâ€™s most significant diplomatic association since the end of the second world war. May will aim to strike a note of reconciliation when she addresses the Commons, claiming this is the time for Brexiters and remainers to â€œcome togetherâ€� after holding an early morning meeting of her cabinet. â€œWhen I sit around the negotiating table in the months ahead, I will represent every person in the whole United Kingdom â€“ young and old, rich and poor, city, town, country and all the villages and hamlets in between. And yes, those EU nationals who have made this country their home,â€� she will say. â€œThe elite are not safe hiding behind their propaganda fueled media institutions, making unaccountable decisions in Brussels, and silencing citizens who speak out against this insanity. When I am President a tidal wave of revulsion will be coming their way, the likes of which has never been seen before.â€� According to a documentary crew, the tour group burst into spontaneous applause. 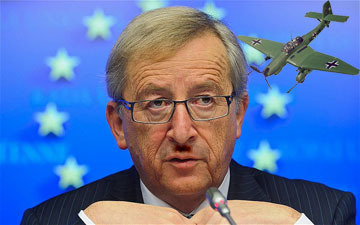 LUXEMBOURG â€“ The incoming EU president, Jean-Claude Juncker, whose father fought in the Wehrmacht in World War II, has vowed to bring back the Junkers Stuka planes into EU service once he is instated. Incoming EU president, Jean-Claude Junckerâ€™s next move is the solidification of an EU army, air force and navy. â€œIt is imperative that the Fourth Reich is unmatched in military power. First port of call for the new EU president Jean-Claude Juncker will be to bring back the infamous Junkers Stuka planes into service for the newly formed EU Luftwaffe. Jean-Claude Juncker (Luxembourgish pronunciation: [ʒ̊ɑ̃ːkloːd ˈjʊŋ.kɐ]; born 9 December 1954) is a Luxembourgish politician. Since 2014, Juncker has been President of the European Commission, which is the European Union (EU) Executive Branch. From 1995 to 2013, he was the 23rd Prime Minister of Luxembourg, and from 1989 to 2009, he was the Minister for Finances. By the time he left office, he was the longest-serving head of any national government in the EU, and one of the longest-serving democratically elected leaders in the world, his tenure encompassing the height of the European financial and sovereign debt crisis. From 2005 to 2013, Juncker served as the first permanent President of the Eurogroup. In early November 2014, just days after becoming head of the commission, Juncker was hit by media disclosuresâ€”derived from a document leak known as LuxLeaksâ€”that Luxembourg under his premiership had turned into a major European centre of corporate tax avoidance. With the aid of the Luxembourg government, companies transferred tax liability for many billions of euros to Luxembourg, where the income was taxed at a fraction of 1%. Juncker, who in a speech in Brussels in July 2014 promised to "try to put some morality, some ethics, into the European tax landscape", was sharply criticized following the leaks. A subsequent motion of censure in the European parliament was brought against Juncker over his role in the tax avoidance schemes. The motion was defeated by a large majority. In 2017, leaked diplomatic cables show Juncker, as Luxembourgâ€™s prime minister from 1995 until the end of 2013, blocked EU efforts to fight tax avoidance by multinational corporations. Luxembourg agreed to multinational businesses on an individualised deal basis, often at an effective rate of less than 1%. Jean-Claude Juncker is a wily and formidable operator with a strong motive to resent Britain that is rooted in David Cameronâ€™s campaign to stop him taking the European Unionâ€™s most powerful job. His methods, combined with Luxembourg's sometimes sinister political culture, have rung alarm bells. Until last year, Mr Juncker dominated politics in Luxembourg for a generation, serving as prime minister for 19 years and running the Grand Duchy as a fiefdom. His regime, mirroring his own tendency to be secretive, had a dark side in the form of the Luxembourgâ€™s sinister security services, the SREL, which holds a file on almost every resident. He resigned last year after a bizarre scandal involving telephone tapping by Luxembourgâ€™s intelligence service, including a conversation between him and his spy chief that was taped on a recorder disguised as a wristwatch. There have been other revelations. Roger MandÃ© served as Mr Junckerâ€™s personal chauffeur for over a decade but wanted a more glamorous career than the humdrum life of a professional driver. In 2006, Mr MandÃ© became a spy, joining the secret service after a personal intervention from Mr Juncker. Many in Brussels are concerned that Mr Juncker will bring Luxembourgâ€™s political culture with him when he comes to the commission. This is a concern because in March 1999 under the leadership of Jacques Santer, its last Luxembourger president, the commission collapsed in ignominy amid scandals over endemic corruption and nepotism. â€œIt is fair to say people are nervous," said an EU official. 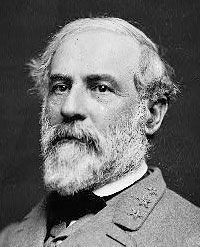 done everything they can for us to lose it." Ahead of Sundayâ€™s French presidential election, Marine Le Pen has received a boost in support following a shooting on Parisâ€™ Champs- Ã‰lysÃ©es that left one policeman dead, according to an opinion poll released Friday by Odoxa. The leader of the far-right National Front, whose campaign has been dominated by anti-Islam and anti-immigration rhetoric, moved from 22 percent to 23 percent in the poll conducted for French weekly magazine Le Point. Her three rivals for the presidency were all shown to have lost half a percentage point of support. Although centrist Emmanuel Macron remained out in front ahead of the first round of voting, he dropped back to 24.5 percent. Republican candidate FranÃ§ois Fillon and leftist candidate Jean-Luc MÃ©lenchon, meanwhile, were back on 19 percent. who is changing the tread title ? It's a sub-title ... perfectly 'legal'. It has seen the light again. And Paris cries with joy. the 66,000 polling stations for Sunday's election ..."
Polls have opened in the first round of Franceâ€™s most unpredictable and high-stakes presidential election in decades, with far-Right leader Marine Le Pen and the maverick centrist Emmanuel Macron leading the field. A Le Pen victory could lead to the collapse of the European Union, experts warn, but after the victory of Donald Trump in the US and the Brexit vote in the UK, most agree that there is no safe bet in the French race. ... there are just four who stand a chance of getting through to the run-off on May 7: Ms Le Pen, Mr Macron, the communist-backed firebrand Jean-Luc-MÃ©lenchon, and the scandal-scarred conservative FranÃ§ois Fillon. Trump is showing his political smarts again. RINO-loving azzhat Hugh Hewitt will, unfortunately, be moderating the 9/16 debate, so don't be surprised if he does his best Megyn "Candy" Kelly impression. However, I'm very glad to see that Mr. Trump is putting this bootlicker on notice. Macron declared that he would run in the election under the banner of En Marche!, a centrist movement he founded in April 2016.
the globalists' and owned by Goldman Sachs? Does Obama's 'friendly call' hint at support for centrist Macron in French poll? French presidential candidate Emmanuel Macron spoke with former U.S. president Barack Obama on the phone on Thursday, in an apparent sign of support just three days before the first round of an uncertain presidential election. Macron said Obama wanted to exchange views about the French presidential campaign and that the ex-president had stressed how important the relationship between the two countries was. "Emmanuel Macron warmly thanked Barack Obama for his friendly call," Macron's party "En Marche!" said in a statement. As much as the pro-globalism pundits and opinion makers, many of whom masquerade as journalists, hate to admit it, the neo-Cold War nurtured by Barack Obama, Francois Hollande, David Cameron, Angela Merkel, and Matteo Renzi â€“ is now over. The new war is between the forces of globalism and populism. The end game for the globalists is a unipolar world in which the decisions are formulated in Washington with the bureaucracies in Brussels, London, The Hague, and Berlin acting as the implementers. Although the corporate media has reluctantly re-branded them from Â«far-rightÂ» to Â«populistsÂ», the political forces that are opposed to globalism are fighting for a multipolar world where national sovereignty, majority cultural and religious rights and customs, and domestic industrial protection rule the day. 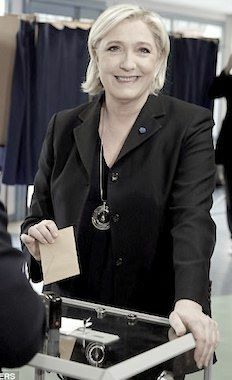 Marine Le Pen from becoming president after the election results posted Sunday. Le Pen and centrist Emmanuel Macron will move on to a run-off election May 7, according to early exit polls. Conservative Francois Fillon finished third and conceded shortly after the first results were announced. Fillon urged his supporters to back Macron in the run-off election, as Le Pen would divide the country. Fillon said in his concession speech. If I hear " the centrist Emmanuel Macron and far-right leader Marine Le Pen "
Just another globalist, banker hack deceiving the public! Dont fall for it ,France! German Chancellor Angela Merkel warned the UK it would not be granted the same rights as other EU nations once Brexit is finalized. Delivering a speech hours after British Prime Minister Theresa May commented that she wants a â€œdeep and special relationshipâ€� with the EU, Merkel warned on Wednesday that the UK should not be fooled into thinking that it will have a prosperous future relationship with the bloc. EU chief Jean-Claude Juncker has repeatedly called on his colleagues to financially and culturally punish Britain for leaving the EU, even going as far to say that other member states will be too scared to leave the bloc after it makes an example out of Britain. Labour has drawn up a secret plan to allow thousands of unskilled migrants to enter the UK after Brexit, leaked documents seen by the Daily Telegraph have revealed. Jeremy Corbyn's party is considering bringing back a scrapped visa scheme which would allow unskilled labourers to move to the UK and compete with British workers for jobs - including seasonal work on farms and in factories. The policy paper also sets out plans for a green card scheme and admits Labour does not consider cutting net migration a priority. 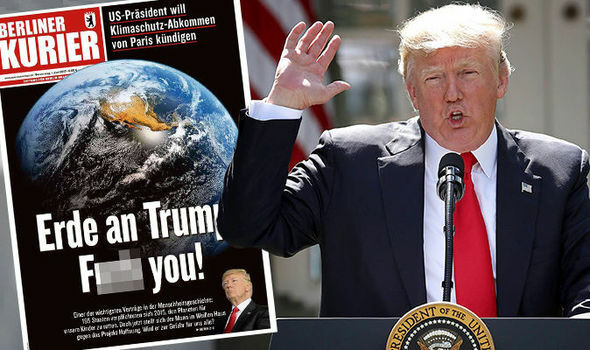 DONALD Trump's decision to pull out of the Paris climate deal has not gone down well in Germany, if this tabloidâ€™s choice of words is anything to go by. German chancellor Angela Merkel was joined by French President Emmanuel Macron and Italian Prime Minister Paolo Gentiloni in condemning President Trumpâ€™s decision to back out of the climate agreement, which is made up of nearly 200 countries.